Quality Air Heating and Air Conditioning > Articles > Heating > When Is It Time to Call for Heating Repair? When Is It Time to Call for Heating Repair? Your heating system really shouldn’t make very much noise, especially if you have a radiant or heat pump system. Combustion systems like a gas furnace or boiler will make some noise when the burner turns on, but loud noises like banging, clanging, buzzing or anything else that sounds odd means it’s time to call us for help. Heating systems are a necessity in Columbus, but that’s not all: your heating system needs to be reliable, too. If your system isn’t delivering the right volume or air or is struggling to reach the temperature you’ve set on your thermostat, the time has come for assistance. Just as your heating system shouldn’t be loud, it also shouldn’t smell. Smells are definitely indicative of a problem, especially if you smell gas or a burning smell. Should you detect any kind of smell, particularly either of the latter mentioned, call for help immediately. As the homeowner, you typically know what to expect for a monthly fuel or energy bill for your heating. If you find that your heating bill has suddenly shot up and you haven’t changed how you are heating your home, there’s a problem somewhere in your system. 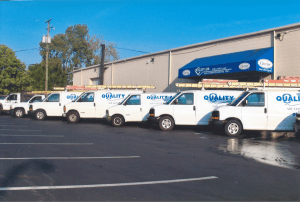 The heating pros from Quality Air Heating and Air Conditioning are here to help you with all of your heating repair needs – just give us a call!